It was advertised as brand new and complete, but with one bag open and a slight dent in the lid. The lid was fine, but in fact there were critical pieces missing which meant for one unhappy little girl. The toys are exactly what we all remember from when we were kids, except that the pieces are larger. What I really want to brag about is the company I bought these from through Amazon. I ordered these on a Saturday. I received them on the following Tuesday - I KID YOU NOT! I hadn't even yet received an email confirmation! I couldn't believe it. I'm using the Tinkertoys in a class project, so I decided to order a second set, and again, the set arrived within 48 hours! I did NOT request special delivery on either. I had never and have still never had any other packages arrive that quickly! We have loved our large set of Tinker Toys. We have had hours and hours of fun with them. We had a smaller set, but found the minimal number of pieces an enormous constraint so when we saw this larger set, we bought it right away. Our kids have been so creative with them, but there is one drawback. They would have loved being able to build more unique things with them. Because of this, we have also purchased a how-to book on Tinker Toys. 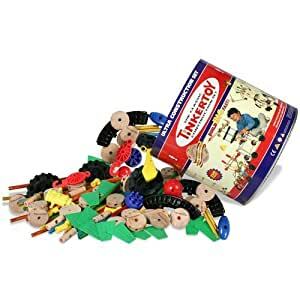 This has added so much to our use of the Tinker Toys. My sons make cars and lawnmowers...my daughter makes strollers for her doll. A great buy!